In preparation for the 2008 Summer Olympic Games, Beijing made numerous, widely-publicized improvements to the city and its environment. One company located far away in the heart of Iowa has seen increased business as a result. In Scranton, a town of roughly 700, New Way® designs and manufactures various models of garbage trucks, some of which are now being used in the cleanup of the Olympic city of Beijing. New Way® is one of the leaders in the US market and its Joint Venture, New Way® China, has now sold over 500 trucks to the country hosting the Olympics, including over 270 to the city of Beijing. 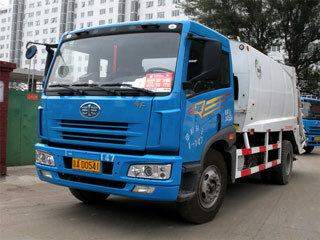 In 1998, New Way® became the first American garbage truck to roll down the streets of China. Because of its reliable and economical design, its technology was quickly in high demand. The New Way® China operation grew to establish two Joint Ventures in the Republic of China, and is now known as the leading manufacturer of garbage trucks there. The locations in mainland China now act as the base for all of New Way®'s sales in the Far East. New Way® China's production capacity is currently over 2,000 trucks annually. The original New Way® facility in Iowa continues to manufacture refuse trucks for the world market. New Way® and its parent company, Scranton Manufacturing, were co-founded in 1971 by John McLaughlin, a self-described ethical businessman and admirer of Henry Ford's philosophies.